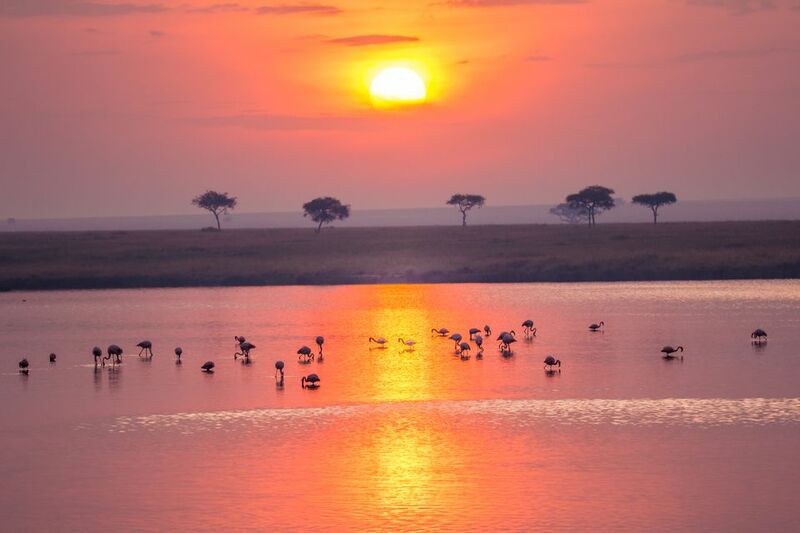 Loosely defined and impossibly large, East Africa is an umbrella term that covers an incredible array of different countries, landscapes, cultures, and ecosystems. This diversity means that there is something for everyone, whether you're more interested in a hot air balloon safari over the Serengeti, or an expedition to see the ancient rock-cut churches of Ethiopia. Kenya's Maasai Mara National Reserve has earned itself a reputation as one of Africa's most rewarding safari destinations, and for good reason. Regardless of the time of year, wildlife sightings are both plentiful and diverse. It's possible to see the Big Five in a single day, and during the July-November dry season, the plains are filled with the vast herds of the annual wildebeest migration. In particular, watching the herds crossing the Mara River in their thousands is a spectacle few will ever forget. Cultural visits to traditional Maasai villages are another highlight of this spectacular East African reserve. Part of Africa's incredible Great Rift Valley, the Omo River Region is perhaps one of the most remote destinations in East Africa. However, those that are willing to make the long and difficult trip to get there will be rewarded with incredible scenery, and the chance to visit villages that have remained unchanged for hundreds of years. There are many different tribes in this part of Ethiopia, and each one has its own traditional dress, culture and ceremonies. In order to get the most out of your Omo River experience, it is advisable to join a tour, some of which combine cultural visits with white-water rafting on the region's famous rapids. Draped in mist and full of lush vegetation, Rwanda's Volcanoes National Park nestles deep within the Virunga Mountains. As Africa's oldest national park, it is one of the best places in the world to encounter the critically endangered mountain gorilla. A subspecies of the wider-ranging eastern gorilla, there are only around 800 of these amazing animals left. To share a moment with them in their natural environment is an intensely moving experience and one that should be at the top of any wildlife lover's bucket list. The park provides a home for several other rare species, including 29 endemic species of bird. Zanzibar is renowned for its fascinating history and its incredible beaches. Located off the coast of Tanzania and surrounded by the azure waters of the Indian Ocean, Zanzibar was once a key stop on the spice route. Here, the island's Arab rulers would trade slaves for spices; and today, Zanzibar's exotic past is evident in its elaborate architecture. Stone Town is one of the island's biggest attractions, boasting ornate houses, narrow alleyways, a Sultan's palace, and many mosques. Zanzibar's white-sand beaches are postcard-perfect, and its reefs are ideal for snorkeling and scuba diving. Those in search of the ultimate safari experience should consider combining a trip to the Maasai Mara with a visit to Serengeti National Park in neighboring Tanzania. Here, breathtaking open plains are dotted with acacia trees and grazing game. It's a great place to spot predators like lion and cheetah in action; especially during the January-March rainy season. At this time, wildebeest descend upon the southern Serengeti to give birth, and the newborn calves make easy prey for hungry cats. In April, the herds start their migration to the Maasai Mara, but the game-viewing remains exceptional all year round. Unlike many of Kenya's other beach towns, Watamu is still considered an enclave of peace and quiet. Located slap bang in the middle of Kenya's exquisite coastline, Watamu is small, relaxed and full of history. It is best known for its stunning bays and palm-fringed beaches, and for its prolific coral reefs. Deep-sea fishing is a favorite pastime here, and several dive schools offer the chance to take up scuba diving. On land, beachfront restaurants serve fresh seafood, Mida Creek boasts stunning birdlife, and Gedi Ruins offers an insight into the life of the 13th Century Swahili people. Tanzania's Ngorongoro Conservation Area is dominated by the ancient Ngorongoro Crater. Approximately 1,970 feet/ 600 meters deep, the crater is the world's largest intact caldera, and one of East Africa's most incredible natural spectacles. Within its rim, countless animals range across the grassy plains of the crater floor, including a significant population of critically endangered black rhino and some of the largest remaining tusker elephants. Black-maned lions are another impressive sight, as are the flocks of flamingo that appear on the crater's soda lake during the breeding season. Perhaps one of the continent's most iconic sights, Mount Kilimanjaro stands in perfect isolation against the foreground of the African savannah. At 19,340 feet/ 5,895 meters, it is the tallest peak in Africa and the world's highest free-standing mountain. Those with a reasonable level of fitness and a keen sense of adventure should consider making the climb for the ultimate Kilimanjaro experience. Climbing with a guide is compulsory, and allowing a few extra days to ​acclimatize to the altitude is advised. Depending on your route, the climb takes five to nine days. Located in the heart of Ethiopia's northern highlands, Lalibela is a historic town of great religious importance for the country's Orthodox Christians. In the 12th Century, it was designed as a 'New Jerusalem'; an alternative for pilgrims who were prevented from traveling to the Holy Land by conflict. Today, its magnificent rock-hewn churches attract visitors from all over the world. There are 11 of these monolithic churches, each one carved from the rock face. One of them, Biete Medhani Alem, is believed to be the largest monolithic church in the world, and all of them are a testament to the devotion of their creators. The highlight of this Rift Valley park is the eponymous Lake Nakuru, a soda lake famous for its incredible flamingo population. The density of the flamingo flock depends on the time of year. During the dry season, water levels fall and the lake becomes more alkaline, generating more algae for the birds to feed on. At this time, numbers of lesser and greater flamingo can swell to as many as two million birds, creating a rose-hued haze across the lake's surface. The park itself is home to a host of other animals, including lions, rhino and approximately 450 species of bird.